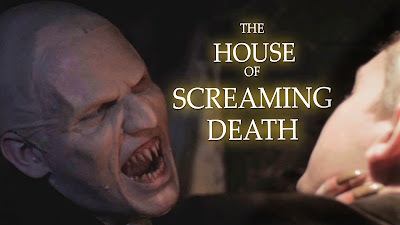 Pop Cinema have recently released the horror omnibus movie THE HOUSE OF SCREAMING DEATH which is available to watch on Amazon now in the US. A VOD/ physical release is scheduled for Spring in the UK. Starring Ian McNeice (From Hell, Doctor Who), THE HOUSE OF SCREAMING DEATH is a chilling collection of blood-curdling tales in the vein of Amicus and Hammer studios’ classic horror that critics are calling “sinister” and “creepy” (365Flicks) and “a great time in horror” (HorrorSociety.com). Ghouls, demons, witches and the undead stalk the halls of an eerie mansion known as Bray Manor, summoned forth over the course of one night by the tales of a mysterious figure known as The Architect. Listen if you dare to these terrifying tales of the macabre, because as each end comes a spine-tingling twist – while the Architect has one last devilish secret of his own to share!